How much are your kids sitting? How much are you sitting? 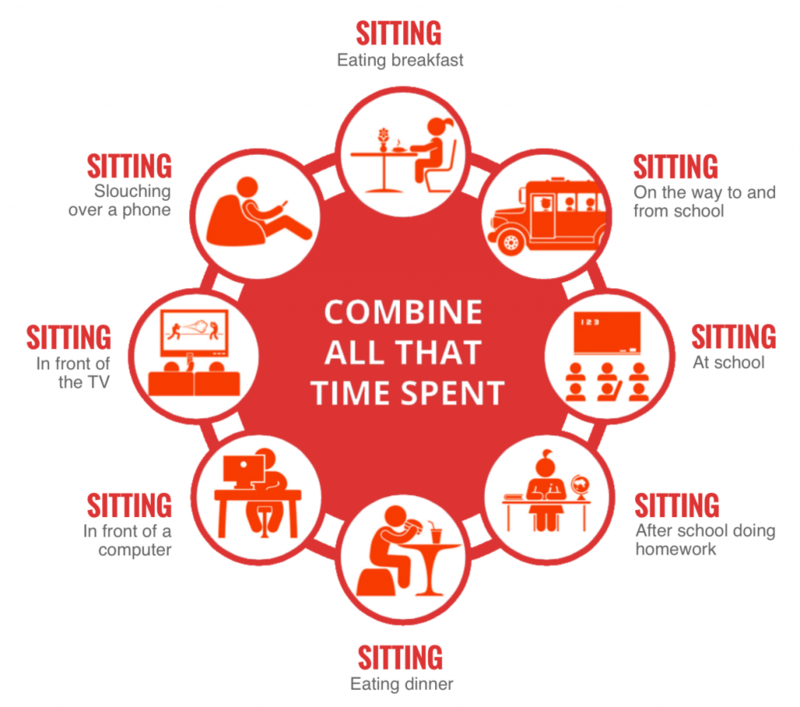 This infographic is a good illustration of how much time our kids sit or more importantly how inactive our kids can be throughout the day. How often are you sitting? Look at this graphic again. Think about your day. How often are you sitting? You drive to work, you sit in your office or cubicle, then sitting for lunch, and then back to work. When the day is done you drive home, eat supper and watch tv or sit at the computer. We are too sedentary. Our joints are meant to rotate/slide. Our muscles are meant to contract. We are meant for movement! Take mini breaks while at work. Get out of your chair more. Walk to talk to colleagues rather than email. Get a sit to stand desk so you can stand more. Take walks at lunch or after, or better yet, both. Get a fitbit or other form of pedometer and challenge yourself to walk at least 10,000 sets a day. Join a gym but chose standing exercises versus machine based exercises. If you can’t do these activities because of pain then you need to see someone who can help you figure out what you need to do to get you moving more and with less pain.